If you are thinking of flooring options for your kitchen that are not only elegant but also eco-friendly, then bamboo flooring should figure right on top of your list. This flooring that is mostly made in Asia is catching the fancy of the Western world slowly; it would still take a while for bamboo to establish itself as a formidable flooring preference. The elaborate process – steaming the pieces, flattening and gluing them together, and then finally finishing the product – involved in making the bamboo floor lends it strength and durability. Bamboo flooring in a kitchen. Photo courtesy of JD Stairs. Even though it’s not waterproof, the fact that it is water resistant makes it a great option for kitchen flooring. You do not have to worry about moving around the objects or too many people walking too often in your cooking area; bamboo flooring can resist heavy traffic. It’s as comfortable as the other hardwood flooring options. You do not have to worry about having to replace the bamboo flooring due to denting, termite attack, or damage to its surface; such complaints are rare. The subtle color difference makes bamboo floor a very interesting choice. It’s usually available in “honey” and a dark brown shade. But they are changed to other colors during the staining process. You could either get the horizontal or the vertical grain arrangement with the former adding a very warm and natural feel to the flooring. That bamboo grows faster than the other trees used for wooden flooring makes it a fabulous alternative to hardwood flooring. Bamboo is also renewable. Thus, with bamboo flooring, you are not only getting value for money but also a very functional and yet exotic kitchen floor. How much would bamboo flooring cost you? Excluding installation costs, bamboo flooring could be anything between $1.50 and $8.00 per square foot, depending on the manufacturer, pattern, finish, and quality. Despite being not very inexpensive, it saves you more money than the other hardwood flooring options. What to look out for when you decide to buy bamboo flooring? 1. Look for established brands as this would ensure that the bamboo flooring is genuine, meets the quality standards, and follows all the environmental guidelines specified. Even if you are paying a few extra bucks, you need not worry about the quality of the product as most bamboo floors are produced in countries that probably don’t have many regulations in place. Contractions, expansions, and visual imperfections are some of the issues you would have to contend with, if you buy low standard bamboo flooring. Some of the well known brands are Ecotimber, Yanchi, Stepco, Teragren, and Morning Star. 2. In the highest quality bamboo floorings, you’ll find the strand-woven technology that makes bamboo flooring what it is – very hard, durable and water resistant. Aluminum oxide coating makes the floor perform better against high traffic, dampness and also stains, indents, and abrasive scratches. Its ability to keep off moisture can be enhanced by applying another finishing coat to the underside. The underlying surface has to be prepared and it should be made level and dry. Either the bamboo may not stick to the subfloor or it could creak or could even rot if there is any moisture. After the subfloor is adequately readied, you would have to glue or float or nail the bamboo flooring. In the floating method, the bamboos are just snapped in place without even using glue. Finally, you may need to seal the floor, to ensure that water does not seep under the flooring and the planks remain dry. Check with your manufacturer’s instructions before proceeding. Look at ‘How to install’ tips provided by the manufacturer. 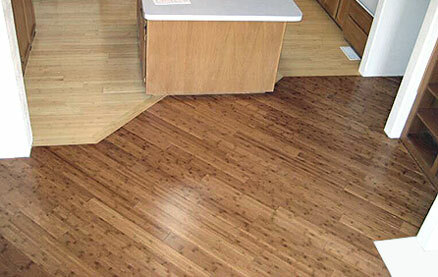 Even though there are some basic techniques involved in fixing the floor, the exact procedure could differ depending on the brand and style of the bamboo floor. Only if you are absolutely certain of how to go about laying the floor, should you do it. You can always seek professional assistance; you do not want your lack of woodwork skills to be lowering the standard of the floor. Do not violate the instructions in the manufacturer’s manual; not only would you end up having to replace the flooring repeatedly but you would also lose the warranty assured on the flooring. In order to clean your bamboo floor, vacuuming and damp mopping is all that is needed most often. When you spot a spill, you must get rid of it immediately. Simple measures like these would ensure that the floor lasts longer and also retains its beauty. Placing a doormat at the entrance would make cleaning the bamboo flooring less of a hassle; you are preventing dust and grime from entering into the kitchen and settling on the floor. Of course, you would have to clean the doormat regularly. A few years after getting the bamboo flooring, refinishing it could restore the floor to its former beauty and also enhance its ability to resist water. This makes the floor appear attractive again and such periodic cleaning would ensure that the floor is not dirty. BuildDirect appears to be one of the best places to buy the bamboo flooring from. Besides the best prices, their customer friendly policies make buying from them a pleasure. Good informative post, describing every question in mind about bamboo flooring. You have described from every point of view, I really enjoyed while reading your post. Bamboo flooring is quickly gaining popularity in the flooring industry. This is due to its natural ability to give you the beauty of wood flooring in your homes with nearly zero damaging effects on the environment. Bamboo in general is coming the “green” choice for thousands of products from clothing to paper goods. Bamboo flooring is a great alternative to wood and laminate flooring. It is both a stylish and responsible flooring option. Bamboo flooring can be used in kitchen? Does bamboo flooring have the high durability to be used in the room with high activity? As it is mentioned above, in the highest quality bamboo floorings, you’ll find the strand-woven technology that makes bamboo flooring what it is – very hard, durable and water resistant. Thanks for sharing this information. I was searching for related sites and posts regarding bamboo flooring and I am happy I’ve found your article that answered my questions. Bamboo flooring is great. More and more are using it. Since the demand is high, I think the bamboo flooring prices will increase too, right? Thanks for your tips by the way. I thought it would cost more nowadays.